Naushad Ali (25 December 1919 – 5 May 2006) was an Indian music director for Hindi films. He is widely considered to be one of the greatest and foremost music directors of the Hindi film industry. He is particularly known for popularising the use of classical music in films. His first film as an independent music director was Prem Nagar in 1940. His first musical success film was Rattan (1944), following it up with 35 silver jubilee hits, 12 golden jubilee and 3 diamond jubilee mega successes. Naushad was conferred the Dadasaheb Phalke Award and the Padma Bhushan in 1982 and 1992 respectively for his contribution to the Bollywood film industry. 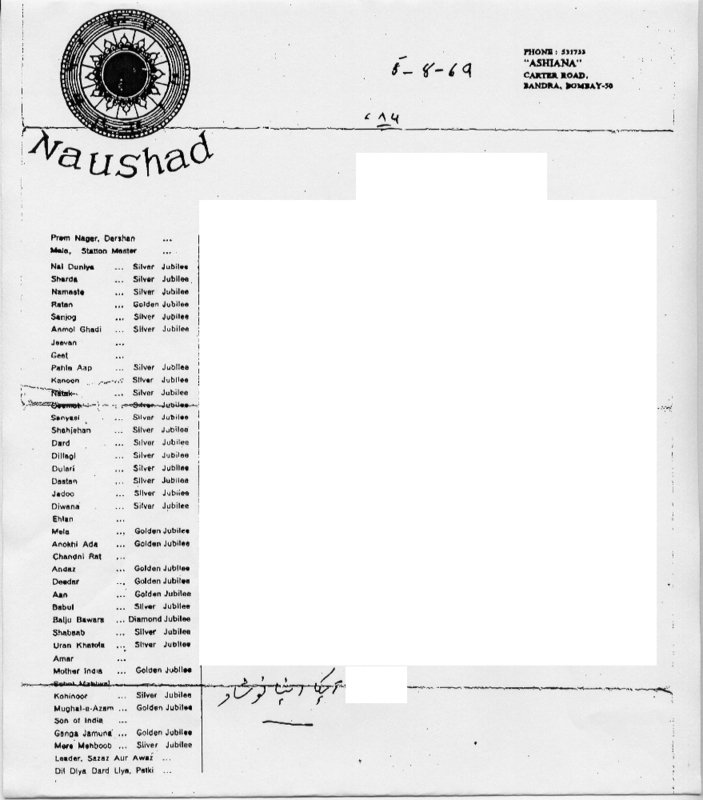 Naushad was born and raised in Lucknow, a city with a long tradition as a center of Indian Muslim culture. His father, Wahid Ali, was a munshi (court clerk). As a child, Naushad would visit the annual fair at the Deva Sharif in Barabanki, 25 km from Lucknow, where all the great qawwals and musicians of those days would perform before the devotees. He studied Hindustani music there under Ustad Ghurbat Ali, Ustad Yusuf Ali, Ustad Babban Saheb and others. He also repaired harmoniums. As a lad, he joined a junior theatrical club and was appointed the club's music maestro for their theatrical presentations. He used to watch silent films at the Royal theatre in Lucknow. Theatre owners would hire a team of musicians to play the tabla, harmonium, sitar and violin. The musicians would watch the film first, make notes, finalize the scales required. When the show began in the evening, they would sit in front of the screen and play music for the scenes. This was a great way to be entertained and learn music at the same time. It made him grasp the nuances required in composing a film's background music score. In time Naushad formed his own Windsor Music Entertainers or just Windsor Entertainers, so named because he had seen the word "Windsor" around Lucknow and liked its ring. It led to the Indian Star Theatrical Company in a theatre at Golaganj colony in Lucknow. He was trained under Laddan Khan until he became capable of working independently as a composer. There he also developed the sense to pick rare musical jewels from the folk tradition of Punjab, Rajasthan, Gujarat and Saurashtra during the company's sojourns in those regions. The travelling players got as far as Viramgam in Gujarat, where they discovered penury, even after selling off theatrical props and musical instruments. The company limped back to Lucknow through the kindness of one of Naushad's friends. Naushad had already become a cinema fan in the silent era and then, in 1931, Indian cinema got voice and music that further fascinated the 13-year-old boy. But his family was strict follower of Islamic diktat of prohibition of music and his father gave him ultimatum to leave music if he wanted to stay at home. He ran away to Mumbai in late 1937 to try his luck as a musician. In Mumbai, he initially stayed with an acquaintance from Lucknow (U.P.) at Colaba and after a while, shifted to Dadar opposite the Broadway theatre where he would sleep on the footpath. He assisted music director Ustad Jhande Khan who was at the peak of his success those days, at a monthly salary of Rs 40. The producer was a Russian and the studio was at Chembur. The film could not be completed. Naushad was a piano player so he worked as a pianist in composer Ustad Mushtaq Hussain's orchestra. He then polished off an unfinished film score and got a credit as assistant to Hussain. Then the film company collapsed. Composer Khemchand Prakash took him on as his assistant for the film Kanchan at Ranjit Studios at a salary of Rs 60 per month, for which Naushad remained extremely grateful and in interviews, he had called Khemchand his guru. His friend, lyricist D. N. Madhok, trusted Naushad's unusual talent for composing music and introduced him to various film producers. Chandulal Shah, the owner of Ranjit Studios, offered to sign Naushad for one of his forthcoming films. Naushad composed a thumri for this film, "Bata de koi kaun gali gaye Shyam", but the film never got on the floors. He was assistant music director for the Punjabi film Mirza Sahib (1939). He composed for his first independent film Prem Nagar in 1940 that had a story set in Kutch for which he did a lot of research into the folk music of the area. With A.R. Kardar's film Nayi Duniya (1942), he got first credit as "music director" and he began to work regularly for Kardar Productions. He however had a flexibility that he could work outside Kardar Productions and this arrangement continued ever after. He first got noticed with A.R. Kardar's film Sharda (1942) wherein 13-year-old Suraiya debuted with the song "Panchhi Ja" for the playback for heroine Mehtab. It was Rattan (1944) that took Naushad right to the top and enabled him to charge Rs 25,000 a film during those days. Film expert and author Rajesh Subramanian opines that Kardar production spent Rupees seventy five thousand in 1944 to make Rattan. The music by Naushad saheb was such a phenomenal hit that the company earned Rs 3 lacs as royalty from gramophone sales in the first year. But his Lucknow-based family remained against music and Naushad had to hide from his family the fact that he composed music. When Naushad got married, the band was playing the tunes of the super hit songs of Naushad's film 'Rattan'. While Naushad's father and father-in-law were condemning the musician who had composed these songs, Naushad dared not tell them that it was he who had composed the music. Naushad worked with several lyricists, including Shakeel Badayuni, Majrooh Sultanpuri, D. N. Madhok, Zia Sarhadi, and Khumar Barabankvi. Mother India (1957), for which he had composed music, was the first Indian film that got nominated for Oscar. In 1981, Naushad was awarded the Dadasaheb Phalke Award for his lifetime contribution to Indian cinema. He composed the tunes of Taj Mahal: An Eternal Love Story (2005) at the age of 86. Amongst his assistants, Mohammed Shafi, Jerry Amaldev and Ghulam Mohammed stand out prominently. Five films have been made on his life and work. Biographical books published are Dastaan-E-Naushad (Marathi) by Shashikant Kinikar; Aaj Gaawat Man Mero (Gujarati); Hindi and Urdu biographical sketches in Shama & Sushma Magazines respectively, titled "Naushad Ki Kahani, Naushad Ki Zubani"; the last one was translated into Marathi by Shashikant Kinikar. Kinikar also came up with a book titled "Notes of Naushad" which puts together some interesting anecdotes of Naushad's life. Naushad also composed background music for the TV serial "Akbar The Great" telecast in 1988 which was directed by Akbar Khan, brother of Hindi film stars Sanjay Khan and Feroze Khan as also "The Sword of Tipu Sultan" produced and directed by Sanjay Khan and Akbar Khan which was telecast in 1990 and became very popular. Naushad died on 5 May 2006 in Mumbai. He was buried at the Juhu Muslim cemetery. He is survived by six daughters Zubeda, Fehmida, Farida, Sayeeda, Rashida, and Waheeda and son Rehman Naushad, Raju Naushad & Iqbal Naushad. Rehman Naushad being the eldest of all assisted him in some of his films. Also, Naushad composed music for two movies directed by Rahman Naushad, My Friend (1974) and Teri Payal Mere Geet (1989). Naushad had requested the Maharashtra State Government to sanction a plot for an institution for promoting Hindustani music. This was sanctioned during his lifetime and the 'Naushad Academy of Hindustani Sangeet' was formed. Naushad was also a respected and published poet and formally launched his book of Urdu poetry entitled Aathwaan Sur ("The Eighth Note") and the Navras label's album titled "Aathwan Sur – The Other Side of Naushad" having 8 ghazals as part of Hounslow's book fair and festival "Bookmela" in November 1998. The album has lyrics and composition by Naushad, arranged by Uttam Singh. Naushad was known for his deft adaptation of the classical musical tradition for movies. For some movies like Baiju Bawra, he composed all scores in classical raga modes and arranged for the well-known vocalist Amir Khan to be a music consultant for the film. He could easily work with Western instruments, including the clarinet, the mandolin and the accordion. He could incorporate Western musical idioms in his compositions and compose for Western-style orchestras. During the early 1940s, recordings were done in quiet parks and gardens after midnight because the studios did not have sound-proof recording rooms. In the gardens there would be no echo and disturbances, unlike the studios where the sound reverberated because of the tin roofs. For films like 'Uran Khatola' and 'Amar', he recorded the voice of a particular artiste on a scale of 90, then recorded it on 70, then on 50 and so on. After the complete recording, it was played for the scene and the impact it created was terrific. He was one of the first to introduce sound mixing and the separate recording of voice and music tracks in playback singing. He was the first to combine the flute and the clarinet, the sitar and mandolin. He also introduced the accordion to Hindi film music and was among the first to concentrate on background music to extend characters' moods and dialogue through music. But perhaps his greatest contribution was to bring Indian classical music into the film medium. Many of his compositions were inspired by ragas and he even used distinguished classical artistes like Amir Khan and D.V. Paluskar in Baiju Bawra (1952) and Bade Ghulam Ali Khan in Mughal-e-Azam (1960). Baiju Bawra (1952) demonstrated Naushad's grasp of classical music and his ability to bring it to the masses, for which he won the first Filmfare Best Music Director Award in 1954. For Aan (1952), he was the first to use a 100-piece orchestra. He was the first composer to have developed the system of western notation in India. The notation for the music of the film 'Aan' was published in book form in London. In Uran Khatola (1955), he recorded an entire song without the use of orchestra, having replaced the sound of musical instruments with choral sound of humming. For Mughal-e-Azam (1960) song Ae Mohabbat Zindabad, he used a chorus of 100 persons. He asked Lata Mangeshkar to render a part of the song "Pyaar Kiya To Darna Kya" in a bathroom that had glazed tiles and then recorded the music to get the echo effect. For Ganga Jamuna (1961), he used lyrics in chaste Bhojpuri dialect. He used just six instruments in the title song of Mere Mehboob (1963). In 2004, a colorized version of the classic Mughal-e-Azam (1960) was released, for which Naushad had the orchestral music specially re-created (in Dolby Digital) by today’s industry musicians, while maintaining all the solo vocals from the original soundtrack. To elaborate, the playback vocals (though not the chorus) recorded four decades ago are mixed with orchestra tracks created in the present millennium. As Indian film music gradually assumed a Western bend starting in the late 1960s, Naushad came to be considered old-fashioned. Composers who could compose rock-and-roll and disco-inflected music started getting increasingly popular. Naushad was still esteemed as a maestro, but his talents were sought mostly for historical movies where traditional scores were appropriate. Prem Nagar 1940 Mohan Dayaram Bhavnani Ramanand, Bimla Kumari, Husn Banu, Rai Mohan, Nagendra, Salu, Gulzar Naushad was assistant for Baaghbaan (1938) and Kanchan (1941). According to him, he had composed one song in each film. Nai Duniya 1942 Abdul Rashid Kardar Jairaj, Shobhna Samarth, Wasti, Azurie, Mazhar Khan. Hari Shivdasani, Jeevan Debut of Singer Surayya in the song "Boot Karoon main Polish"
Dard 1947 Abdul Rashid Kardar Uma Devi, Suraiya Debut of Singer Uma Devi (Comedy Actress Tuntun) in the song "Afsana Likh Rahi Hoon"
Baiju Bawra 1952 Vijay Bhatt Bharat Bhushan, Meena Kumari Also as Co-producer Film debut of singers Amir Khan and D. V. Paluskar in the song "Aaj gaavat man mero jhoomke"
Sohni Mahiwal 1958 Raja Nawathe Bharat Bhushan, Nimmi Debut of singer Mahendra Kapoor in the song "Chaand Chhupa Aur Taarey Doobey"
Mughal-e-Azam 1960 Karim Asif Dilip Kumar, Madhubala, Prithviraj Kapoor, Durga Khote, Ajit Film debut of singer Bade Ghulam Ali Khan in the songs "Shubh din aayo" and "Prem jogan ban ke"
Aathwan Sur - The Other Side of Naushad : This was a Ghazal album released in 1998 and had all its songs composed by Naushad and sung by Hariharan. : Best Music for "The Sword of Tipu Sultan"
^ Bharatan, Raju (2013). Naushadnama: The Life and Music of Naushad. Hay House. p. 352. ISBN 9789381398630. ^ "Naushad Ali: India's foremost music director". Arab News. 3 August 2012. Retrieved 31 January 2018. ^ Raju Bharatan (1 August 2013). "Preface". Naushadnama: The Life and Music of Naushad. Hay House, Inc. pp. 48–. ISBN 978-93-81398-63-0. Retrieved 26 January 2015. ^ Ganesh Anantharaman (January 2008). Bollywood Melodies: A History of the Hindi Film Song. Penguin Books India. pp. 31–. ISBN 978-0-14-306340-7. Retrieved 26 January 2015. ^ CHOPRA, SATISH. "The man, his music". Retrieved 6 May 2012. ^ Jaisinghani, Bella (11 February 2010). "Rafi, Madhubala don't rest in peace here". The Times of India. Retrieved 14 February 2010. Wikimedia Commons has media related to Naushad.